Even with the first announcement, scientists wondered why the collision’s gamma rays looked weaker than expected. They surmised that the collision released collimated jets of particles, and we just weren’t in the line of fire. But a few new papers have released further data on the collision’s radio waves and x-rays—and demonstrate that the story probably isn’t as cut-and-dry as that. On August 17, observatories across the world spotted GW170817, the result of two colliding stars, each a little heavier than the sun but only the size of a small city. They emitted gravitational waves, tiny ripples in spacetime, alongside all sorts of light, including infrared and ultraviolet, visible light, x-rays, gamma rays, and radio waves. It was immediately obvious that the gamma-ray signature was not from a jet of particles pointed directly at the Earth. Maybe it was a jet pointed elsewhere, or something more complex than that. But today, an international team is now reporting a brightening of GW170817's radio waves over time in the journal Nature. A second team recently put a paper on the arXiv, the physics preprint server, demonstrating the same brightening in the x-rays. Clearly something strange is occurring. The radio wave team felt their observations suggested that some sort of wide cocoon or cone of matter is choking the jet. 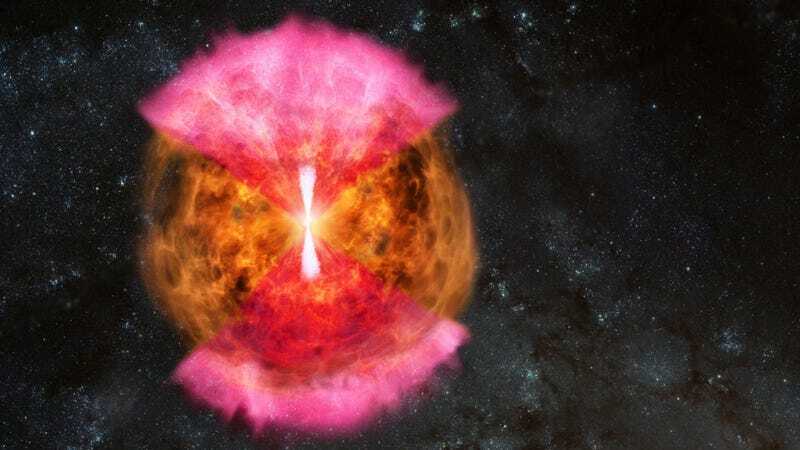 The result would instead be a wide outflow of slower particles, and could potentially produce the radio and gamma ray emissions that they observed.